Sapa’s unique handicrafts, beautiful natural landscape, delicious food, welcoming locals, and authentic culture make it something of a hidden gem. I was drawn to this town while touring Vietnam back in 2018, and it became the highlight of my entire trip, and one of my recommended destinations for 2019. But as charming as Sapa is on its own, it was my day trek through the mountains with Ly, a local guide, that made my visit both unforgettable and education, opening my eyes to the dark side of Sapa tourism. Here’s how to ensure you enjoy Sapa’s beauty without leaving behind a damaging tourist footprint. 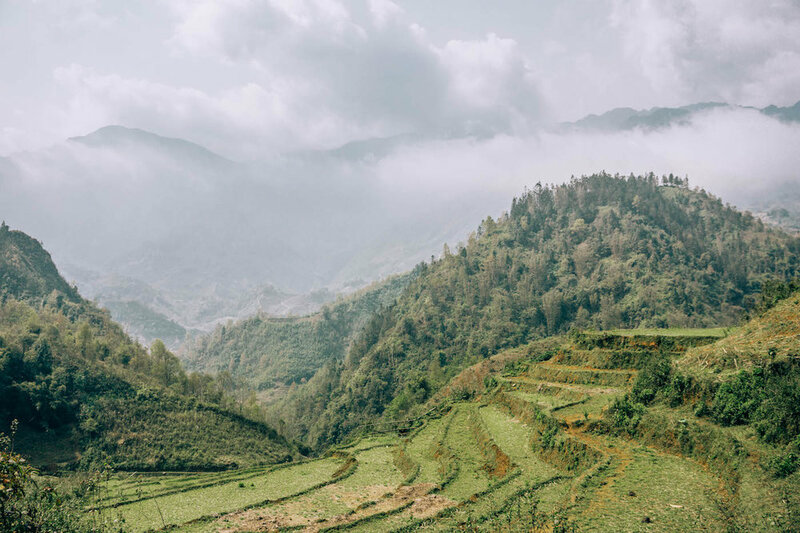 It’s not difficult to fall in love with Sapa, a quaint little town in the Lào Cai Province of northwestern Vietnam, overlooking the rice terraces of the Muong Hoa Valley below. The windy, hilly streets are dotted with cute but unpretentious cafes, family-owned restaurants, handicrafts shops selling indigo-died and hand-embroidered garments, colorful little buildings, and manicured gardens. 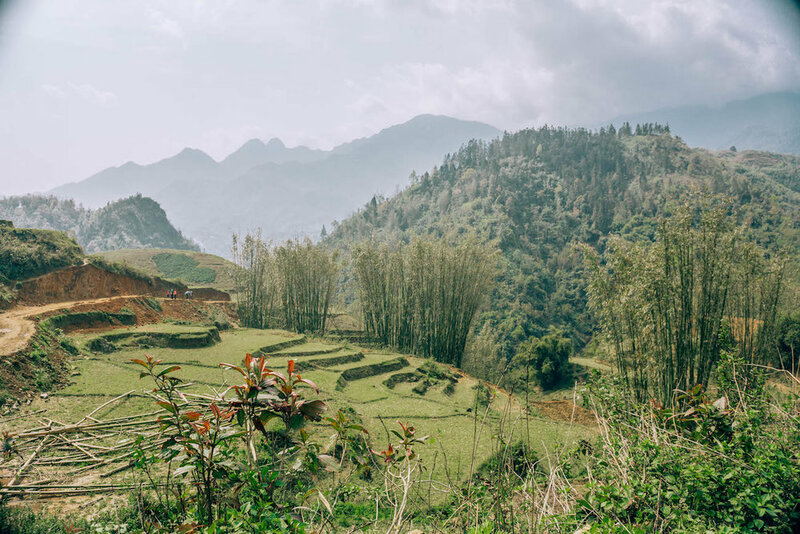 If you’re coming from the chaos of Vietnam’s major cities like Hanoi or Saigon (Ho Chi Minh City), Sapa is even more of a treat — a kind of peaceful, secluded paradise in the Hoàng Liên Son Mountains. 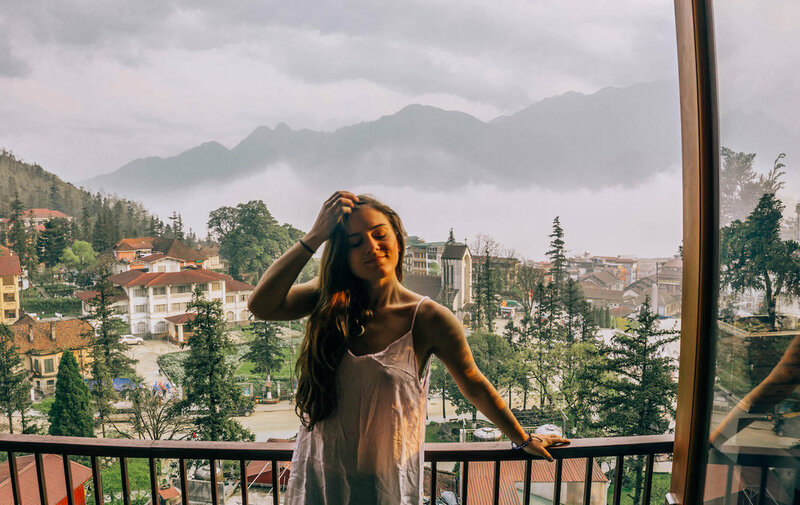 Although Sapa still has a robust tourism industry and infrastructure, you’ll still feel like you’re a bit off the beaten tourist track in one of Southeast Asia’s most popular country for backpackers. Many of the centuries-old hill tribes still inhabit the Muong Hoa Valley, so Sapa is a hub for trekking. Most travelers take a long day-trek through the villages, although multi-day treks are an option. Because of my limited time, I opt for the one-day trek, and was lucky enough to hire Ly as my guide to the area’s culture and landscape. Although hardly 4’ 8" tall, Ly (pronounced "Lee") carries with her a confidence both in personality and in navigating the jungle terrain of the Sapa mountains in northern Vietnam. For today, Ly is my lifeline. She’s guiding me through the jungles, rice paddies, and villages on 13-kilometer day trek, and back again to my little hillside hotel in Sapa’s main town before nightfall. Ly is impressively quick-footed, bounding through rice paddies and along narrow irrigation canals with quick feet dawned in pristine white sneakers as a sort of trophy of her trekking grace. We start the morning just after sunrise. Without hesitation, Ly takes my hand and guides me down a maze of tiny stone alleys behind my hotel before reaching a narrow garden path that marks the beginning of our trek. Within mere minutes, I’ve slipped on wet rocks and muddy hills too many times to count, and my black Nikes are caked in a thick layer of dirt. Despite my obvious shortcomings, I push myself to keep pace with Ly, not only to attempt to prove myself an adept trekker (I’m not), but also because I can’t help but pepper her with questions about virtually everything I see. Plots of vegetable gardens slowly turn into foggy bamboo forests, out of which we eventually emerge into a vast world of mountainside rice paddies. Along the way, breaking off a small brach of bamboo seedlings, Ly teaches me about the plant’s lifeline, how to distinguish young trees from old (fun fact: their size is irrelevant, as bamboo reach their maximum height, up to 100 feet, in just three to four months) and their tremendous variety of uses in the Lào Cai Province, from food to building homes or shelters for cattle. Ly also takes the time to point out the ceremonial spinach flowers glowing golden in the morning sun, the tiny wooden shacks built to house buffalo during cold winter months, and the fields of indigo plants used to dye the village clothing its traditional deep blue hue. Fog drifts between the grassy hills, cloaking the landscape in intermittent blue-greys and soft yellow hues as the sun peaks through gaps in the mist. Minutes later, Ly directs my attention to the dirt road beneath our feet, and the cable car looking rather out of place in the distance. I soak that in for a minute, walking in silence as I try to imagine these secluded, quiet little mountain villages all strung together as a series of “stops” on a trek-free tourist attraction. On the other hand, Ly obviously works in the tourism industry, so I’m interested to know her perspective on it all. “Tourists are good! We in the villages love tourists. But sometimes it destroys our land.” For example, as Ly proceeds to explain, the construction of some recent hotels in the villages have been disastrous for the mountain people. Hotels wipe out large stretches of forest, taking with them the natural barriers that the trees form against landslides. It is the homes of local people, lower in the valleys, that experience the consequences of even minor deforestation. At some point along the trek we pass by a small, understated building that Ly tells me is one of the new hotels. Behind the hotel to the right, stretching maybe half a football field in length down the mountainside, is land dotted in dozens of small wooden huts that I realize are hotel rooms. Up the mountain to the left, more hotel rooms look out over the valleys of rice paddies below. If I hadn’t known better, I likely would have thought this was a beautiful, culturally-immersive, eco-friendly way to experience the Sapa villages. Certainly, this is how they are advertised. Ly is one of these home-stay hosts, along with probably hundreds of other families in the mountain villages who are eager to welcome culturally curious tourists into their simple wooden mountain homes. 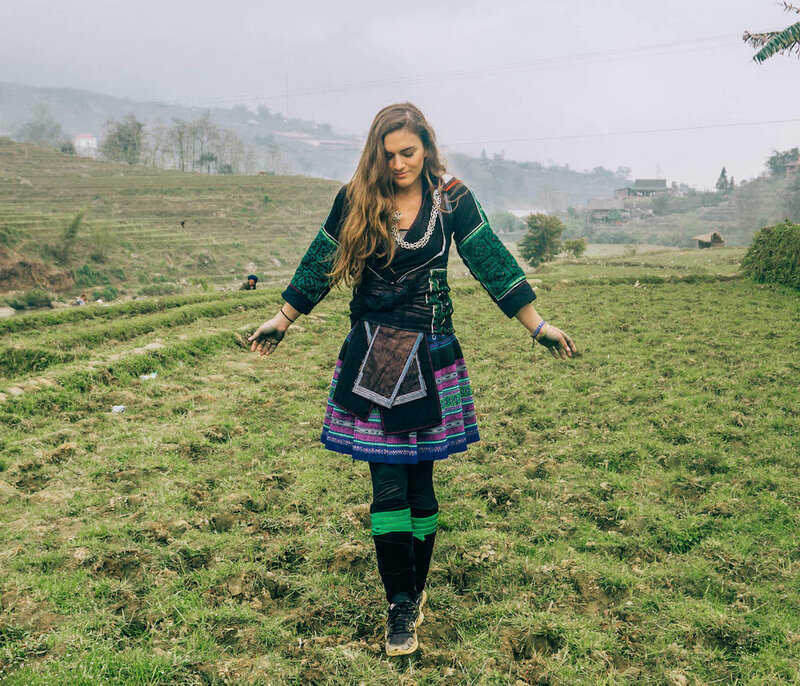 Hosts like Ly will offer tourists authentic and educational experiences, with lessons on cooking local foods, tending to the land and farms, and weaving and dying the beautiful traditional garments worn by all local mountain people. For most of the morning, the towering skeletons of massive soon-to-be hotels and construction cranes loom over the valley from Sapa town perched above, a sort of ominous sign of things to come. While Ly is optimistic about the influx of big hotels in Sapa town, I, perhaps more cynical, can’t help but doubt that big tourism will end at the borders of the rice paddies. With new, big hotels (some with as many as 500 rooms), comes more tourists, more publicity, and, of course, more money to be made. It’s not long before Sapa town disappears behind the trees and fog behind us. We’re left in a world that can only be described as total serenity. 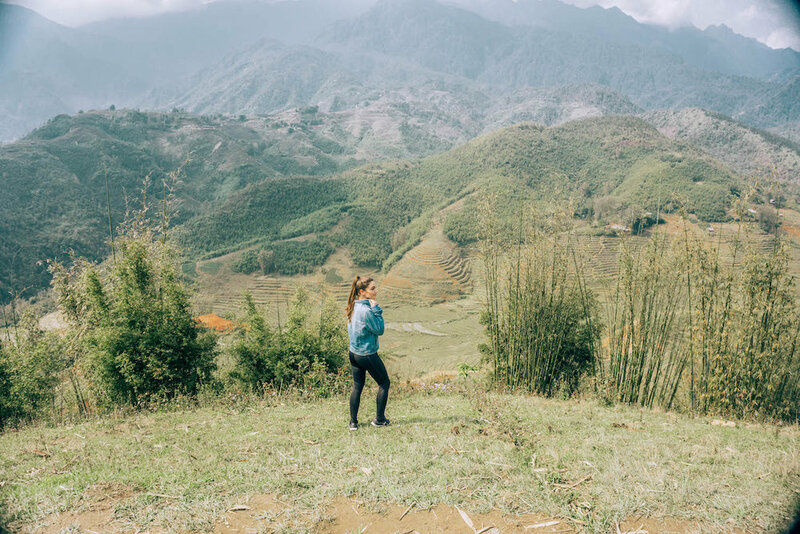 The air is cleaner than any other air I’ve breathed in Vietnam, the jungles appear untouched, and the pigs and buffalo grazing in the rice terraces grunt their songs and ring their cowbells as a kind of melodic soundtrack to sweet mountain life. Ly celebrates every bit of it with me, as we both quietly pray that we’re not some of the last few to see the mountains this way. When we arrive in Cat Cat Village, we stop at Ly’s home: a long stretch of wooden and bamboo planks supporting a flat wooden roof. Ly’s been excited to take me here all morning, and I couldn’t be more thrilled she’s willing to show it to me. There is of course no electricity, no running water — just a series of ambiguous rooms centered around two large rooms: her mother’s Shaman prayer room and a living room with a couple of plastic chairs and a mirror. But peering through the house, dusty and dimly lit only by the cracks of light peeking through gaps in the wooden roof, the scene is far from drab. Rather, Ly’s home is as filled with life as is she. Sheets and sheets of hand-woven hemp blankets and wall hangings are strewn about and adorning the entryway when we enter the home, each blanket colored by intricate and brightly colored embroidery, and died in a massive plastic orange bucket of indigo sitting in a corner by the front door. Fluffy black newborn puppies run around the dirt floor playing with string on the ground; I pick one up and he instantly falls asleep in my arms (this, in my opinion, makes Ly’s the best house I’ve ever visited). An huge stone cornmeal grinder sits by the door, spilling over with corn kernels like flakes of gold. Ly disappears into her room, up a wooden ladder to a suspended loft area that surely could only support a 4’ 8” gentle-footed Vietnamese woman. I don’t dare follow her. Minutes later, she reappears carrying heaps of indigo hemp fabric colored with specks of yellow, pink, red, green embroidery. Thankfully, despite the fact that I certainly would’ve crashed a hold in her roof if I’d climbed onto the loft, I’m still sufficiently Vietnam-sized to fit in Ly’s clothes. It takes at least 10 minutes for Ly to dress me in her traditional clothing, a nine-piece ensemble that can be seen on almost any woman you’d encounter in the village. The garments are indigo-died and woven by Ly’s own hands; but the heavy etched silver chain necklace is welded by her father, as the men are the designated silversmiths of the village. The dress took Ly a year and a half to make. I feel as much like royalty as I could wearing Dior. Apparently I can now pass as part of the “mountain people,” Ly tells me. I’m hardly convinced. As we walk around outside, my new look sends villagers into cheers and applause as I approach and they tell me that it’s only my large brown eyes give me away as a fraud. They love that I’m wearing their traditional clothes and want to take photos of our matching outfits every step of the way. 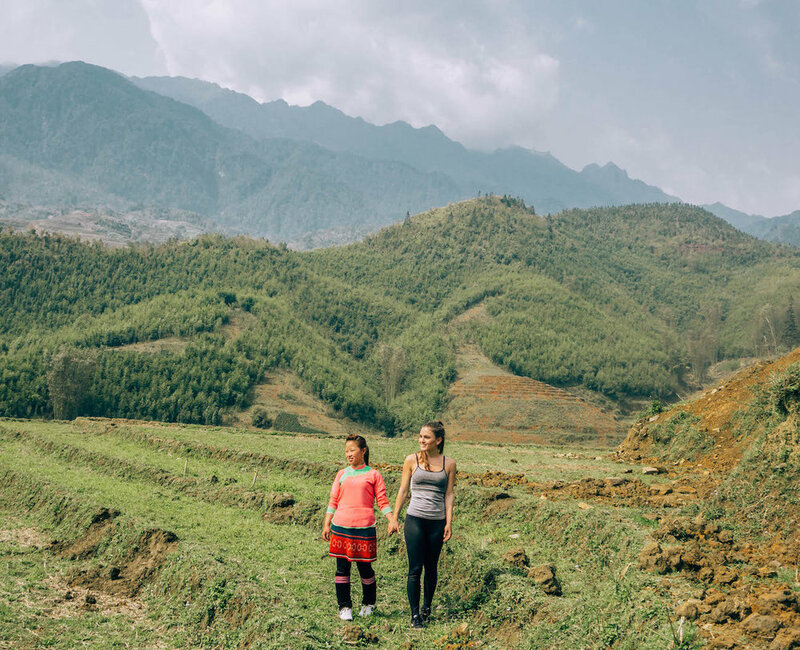 Ly’s enthusiasm for her culture is contagious, although I’m confident that simply stepping foot in this magical little mountain world would be enough for an outsider to catch the Sapa obsession that now plagues me. And if it’s not Ly, it’s the expansive green landscape, the warmth of the local people, the prettiest colors of their clothing, or the images of soft blue-grey buffalo silhouetting the misty sky. It’s a hidden kind of magic — the kind that requires an eight-hour train ride, over an hour’s drive on treacherous unpaved cliffside roads, and 10-plus-kilometer jungle trek to access — and it’s the very magic that draws people to make the journey. Now, if only we can find a way to not destroy the very thing we’ve come to find in Sapa. My trek in Sapa was by far one of my favorite adventures in Vietnam, and I’d encourage anyone and everyone to make the journey as well. But my hope would be that you’ll do everything you can to preserve the area. Accommodations: Stay in a hotel in Sapa town hotel if you want comforts like WiFi and running water. Sapa Panorama Hotel is a great option for affordable prices, a delicious breakfast buffet, and unbeatable views of the town and mountains. If you want a more immersive village experience, choose a home-stay with local hosts like Ly’s family, and avoid hotels in the jungles that contribute to deforestation (even if the hotels are branded as “eco-friendly”). Cable Cars: Don’t take the cable cars — just don’t. If you want to see the views from Fansipan Mountain or get a glimpse of the local villages, hire a local guide and dust off those hiking boots. If trekking isn’t your thing, then there is plenty to keep you entertained and happy in beautiful Sapa town. What To Bring: And although I hope it goes without saying, don’t leave any litter behind, and avoid single-use plastics like water bottles and plastic bags — bring a (full) reusable water bottle (ideally one with a filtration system so you can always have access to clean water; this LifeStraw water bottle is great and every purchase provides a child clean water for a year) and a backpack that can store anything you purchase along the way. In addition to a reusable water bottle and backpack, make sure you have a sturdy pair of sneakers that you don’t mind getting dirty. The trek isn’t strenuous but you will be walking a long distance over unusual terrain, so you’ll want some good quality shoes on your feet. Wear layers, because it can be chilly in the morning and very warm in the afternoon. A lightweight rain jacket is also a good idea, especially during rainy months. Bring sunglasses regardless of the weather, because cloud cover can turn into bright sunny skies in an instant. Other than these basics, be sure to pack a camera, mosquito repellant, and maybe a snack or two for the road, and you’ll be set. Contacting Ly: Definitely send Ly a message on Facebook to book a tour with her. 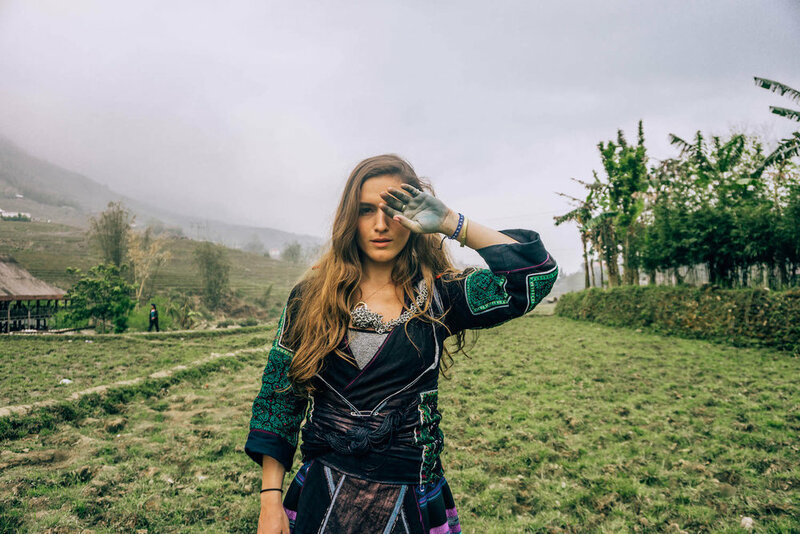 She’ll be thrilled that you want to book with her and you’ll leave with a better understanding of local culture, incredible stories, and, most likely, a new friend. Have you ever been to Sapa? Any other tips for visiting and trekking responsibly? Let me know your thoughts and questions in the comments!